The Bridgewater-Raynham Special Education Parents Advisory Council (BR-SEPAC) will be holding a presentation for the 2018-2019 school year on Wednesday, January 9th at 6:30 pm titled, First Responder/Parent Autism Awareness Training. Anthony Pacino will share training methods for first responders (police, fire, doctors, and nurses) and parent to give them a better understanding of what to expect and how to mitigate difficult situations when working with individuals with autism followed by discussion and sharing of local practices in our home communities. Last day to obtain Nomination Papers: Thursday, March 7, 2019 at 4:00 p.m.
Last day to submit Nomination Papers to Board of Registrars: Monday, March 11, 2019 at 5:00 p.m.
Last day to object or withdraw: Wednesday, March 27, 2019 at 5:00 p.m.
Form CPF M102 Due Friday, April 19, 2019 at 1:00 p.m.
Form CPF M102 Due Monday, May 28, 2019 at 4:00 p.m. The last day to register to vote for the Annual Town Election will be on Monday, April 8, 2019 from 8:00 a.m. to 8:00 p.m. at the Town Clerk’s Office in the Academy Building. City Compost now offers Bridgewater residents curbside composting services. Weekly service through City Compost runs just $5/week and bi-weekly service is $7/week. You have the option to also receive compost back through the program for no additional charge. If you are interested in the City Compost program, please contact us at Around the Common by clicking here and we will connect you with the right folks at City Compost to get your service up and running. Friday, January 4 @ 10:30-11:30 a.m.: The Learning Tree with Ms. Nicole. 10:30-11:30 a.m. Ages 3-5 with adult. Sponsored by Triumph, Inc. Registration is required for this 7 week program. Week 1. Registration for Triumph, Inc. programs with Miss Nicole can be completed by calling Nancy at 508-822-5388 ext. 208. Monday, January 7 @ 10:00-11:00 a.m.: Very Ready Reader with Miss Nicole. Open to ages 18 months to 5 years. Sponsored by Triumph, Inc. Registration required for this 7 week program. Week 1. Monday, January 8 @ 1:30 p.m.: Movie: Olaf’s Frozen Adventure. (30 min). All ages with adult, no registration. Friday, January 11 @ 10:30-11:30 a.m.: The Learning Tree with Ms. Nicole. 10:30-11:30 a.m. Ages 3-5 with adult. Sponsored by Triumph, Inc. Registration is required for this 7 week program. Week 2. Registration for Triumph, Inc. programs with Miss Nicole can be completed by calling Nancy at 508-822-5388 ext. 208. Saturday, January 12 @ 10:30-11:00 a.m.: Book Babies. Lapsit for children up to 30 months with caregiver. Join Mrs. Davis for rhymes, songs, story and playtime. No registration. Saturday, January 12 @ 10:30-11:30 a.m.: Read to Duncan, our lovable therapy dog. The “Read to a Dog” program provides children the opportunity to visit with a dog while building reading skills in a non-judgmental environment. No registration, all ages welcome. Monday, January 14 @ 10:00-11:00 a.m.: Very Ready Reader with Miss Nicole. Open to ages 18 months to 5 years. Sponsored by Triumph, Inc. Registration required for this 7 week program. Week 2. Tuesday, January 15 @ 10:30-11:00 a.m.: Story Time with Miss Emily. Stories, games, a craft and FUN! All ages with adult, no registration. Wednesday, January 16 @ 9:30-10:00 a.m.: Book Babies. Lapsit for children up to 30 months with caregiver. Join Mrs. Davis for rhymes, songs, story and playtime. No registration. Wednesday, January 16 @ 10:30-11:00 a.m.: Story time and craft. Drop in story time for all ages with adult. Join Mrs. Davis for stories, songs, rhymes and a craft. All ages, no registration. Thursday, January 17 @ 10:30-11:00 a.m.: Book Babies. Lapsit for children up to 30 months with caregiver. Join Mrs. Davis for rhymes, songs, story and playtime. No registration. Friday, January 18 @ 10:30-11:30 a.m.: The Learning Tree with Ms. Nicole. 10:30-11:30 a.m. Ages 3-5 with adult. Sponsored by Triumph, Inc. Registration is required for this 7 week program. Week 3. Registration for Triumph, Inc. programs with Miss Nicole can be completed by calling Nancy at 508-822-5388 ext. 208. Saturday, January 19 @ 1:30 p.m.: Movie: Olaf’s Frozen Adventure. (30 min). All ages with adult, no registration. Monday, January 21: Closed for Martin Luther King Jr. Day. Tuesday, January 22 @ 10:30-11:00 a.m.: Story Time with Miss Emily. Stories, games, a craft and FUN! All ages with adult, no registration. Wednesday, January 23 @ 9:30-10:00 a.m.: Book Babies. Lapsit for children up to 30 months with caregiver. Join Mrs. Davis for rhymes, songs, story and playtime. No registration. Wednesday, January 23 @ 10:30-11:00 a.m.: Story time and craft. Drop in story time for all ages with adult. Join Mrs. Davis for stories, songs, rhymes and a craft. All ages, no registration. Thursday, January 24 @ 10:30-11:00 a.m.: Book Babies. Lapsit for children up to 30 months with caregiver. Join Mrs. Davis for rhymes, songs, story and playtime. No registration. Friday, January 25 @ 10:30-11:30 a.m.: The Learning Tree with Ms. Nicole. 10:30-11:30 a.m. Ages 3-5 with adult. Sponsored by Triumph, Inc. Registration is required for this 7 week program. Week 4. Registration for Triumph, Inc. programs with Miss Nicole can be completed by calling Nancy at 508-822-5388 ext. 208. Monday, January 28 @ 10:00-11:00 a.m.: Very Ready Reader with Miss Nicole. Open to ages 18 months to 5 years. Sponsored by Triumph, Inc. Registration required for this 7 week program. Week 3. Tuesday, January 29 @ 10:30-11:00 a.m.: Story Time with Miss Emily. 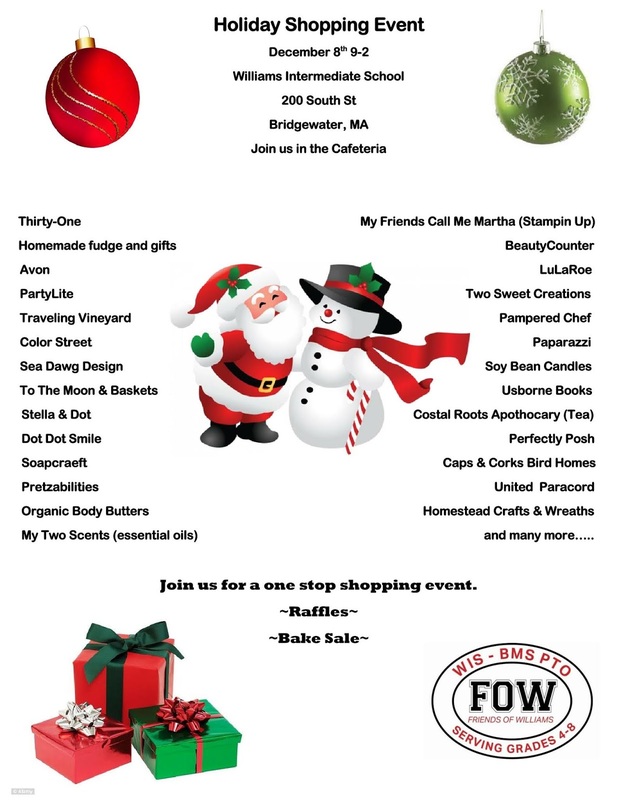 Stories, games, a craft and FUN! All ages with adult, no registration. Wednesday, January 30@ 9:30-10:00 a.m.: Book Babies. Lapsit for children up to 30 months with caregiver. Join Mrs. Davis for rhymes, songs, story and playtime. No registration. Wednesday, January 30 @ 10:30-11:00 a.m.: Story time and craft. Drop in story time for all ages with adult. Join Mrs. Davis for stories, songs, rhymes and a craft. All ages, no registration. Thursday, January 31 @ 10:30-11:00 a.m.: Book Babies. Lapsit for children up to 30 months with caregiver. Join Mrs. Davis for rhymes, songs, story and playtime. No registration. The Bridgewater Community Dance Series, featuring a mix of international folk dance and New England squares and contras, is now in its eighth season. The dances are suitable for ages 10 and up, no prior experience is required, and all dances are taught. Dances are held on alternating Fridays—with some exceptions—from 7:30-9:30 p.m., at the Bridgewater Senior Center. Dates for the winter/spring 2019 series are January 4 and 18, February 1 and 15, March 1, 15, and 29, April 5 and 19, May 3 and 31, and June 7. Cost for the full, winter/spring season—12 sessions—is $72 per person. Single night attendees will be charged $8 per dance, first time attendees get a free night! Dance leader, Sam Baumgarten, professor emeritus at Bridgewater State University, has over 40 years of teaching experience and continues to teach classes at BSU in folk, square, and contra dance. To obtain a registration form or for more information, contact Sam at 774-208-2933, or sbaumgarten@verizon.net. Come to a FREE viewing of the movie Southside with You on Monday, December 17, in Bridgewater. The public is welcome to join us for the viewing and the discussion to follow. Co-sponsored by the Social Justice Committee of First Parish Church and the Bridgewater Citizens for Civility & Respect. Ninth in our Black Lives Matter film series. 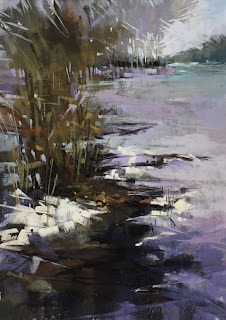 The Bridgewater Public Library will feature “A Sense of Place” a combined exhibit of pastel paintings by Laurinda Phakos O’Connor and Maureen Spinale in the Flora T. Little Art Gallery during the months of December and January. 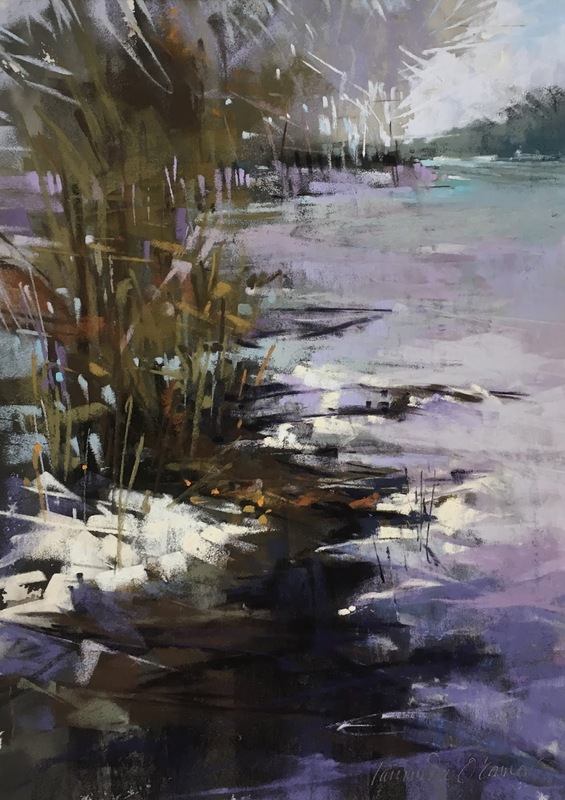 As an artist, Laurinda Phakos O’Connor strives to let simplified strokes create the up-close excitement of color, texture and expression on the surface of paper while she pushes to capture the sense and feel from the landscape. 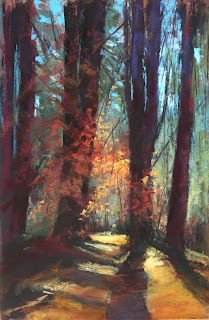 Maureen Spinale has a passion for painting trees and is drawn to the complexities of tangled branches and fractured light beams through the forest. She has evolved her style from a realistic approach to a more contemporary perspective flecked with bold colors, strong lines and light. Both women are award winning artist exhibiting in Boston and on the South Shore. They are Gallery Artists at the South Shore Art Center and Signature Artists of Pastel Painters Society of Cape Cod. For more information, visit www.laurindaoconnor.com; www.maureenspinale.com. An Artist Meet and Greet will be held on Saturday, January 12th at 11:00 am. “Gun Safety, Gun Control, Gun Rights & Responsibilities” presentation given by Professor Mitch Librett, BSU, Chief of Police Chris Delmonte, Town of Bridgewater and Kathleen Berry, Moms Demand Action for Gun Sense at the Bridgewater Public Library on Monday, December 10th at 6:30 p.m. 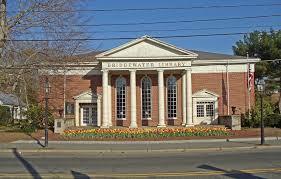 This presentation is the second in a series titled “Being Neighborly, Finding Common Ground” sponsored by Bridgewater Citizens for Civility and Respect (BCCR) and the Bridgewater Public Library. BCCR is a group of local citizens in Bridgewater that have formed an organization whose goal is to ensure that Bridgewater is a safe, inclusive community, one of civility and respect for all. Music performance by The GroovaLottos at the Bridgewater Public Library on Saturday, December 8th @ 12:00 pm. The GROOVALOTTOS are a powerhouse soul-funk-blues trio, comprised of award-winning and seasoned studio and touring musicians, incredible music and wild senses of humor make them one of the most entertaining bands in New England. 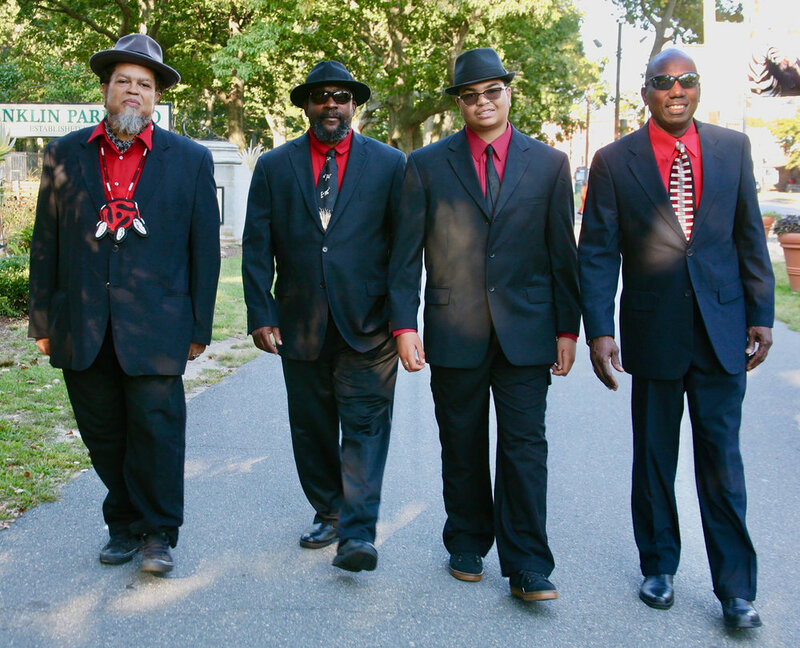 The GroovaLottos are on a journey to continue soul, funk and blues as musical traditions. Said to play with their souls instead of their hands, and heralding from Cherokee, Choctaw and Wampanoag communities, they are also known as the 'Soul-Funk Song Keepers of Native America."